Our Lady of Reepham - An important Historical Shrine, destroyed in the turmoil of the Reformation. In medieval times, St Mary's Church, Reepham, was an important place of Pilgrimage. Whilst not as famous as the Shrine at Walsingham, nevertheless, people came on pilgrimage to Reepham to visit the image of Our Lady of Reepham,Norfolk, which had many miracles attributed to it. 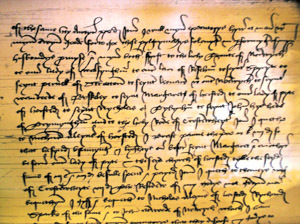 A copy of the Will of Alice Cook is shown here. Although the existence of the Shrine is documented, the Church itself, and its community rarely celebrate or acknowledge its existence as an important part of their heritage. For generations the existence and significance of the Shrine has been supressed and played down by a succession of Evangelical Clergy. As part of historical research for a church website in 2007, a copy of Alice Cook's Will was discovered in the county archives, and a page was created online dedicated to keeping the existence of the Shrine alive on the Parish website. Sadly, the church later decided to remove the website in its entirety along with the historical evidence of the Shrine's existence. This site is dedicated to keeping the historical evidence and miracles attributed to Our Lady of Reepham alive for this and future generations. No Pilgrim Badges or other artifacts have been discovered that can be directly linked with the Shrine, however some local finds which contain the letter "R" might possibly be from this important shrine. Indeed it is believed that some of the wealth within the town in medieval times came from the regular flow of Pilgrims. See more information on the area itself here.